Witnessing a romantic moment is one thing, creating that moment is another. It takes a special wedding officiant with an engaging personality, having the right attitude, and lots of experience to turn a common ceremony into a romantic memory. 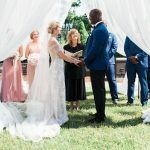 The role of an effective wedding officiant is to set the tone of your wedding by leading you and your wedding party through the ceremony in a way that is relaxed, focused and meaningful. Lori provides this for your wedding ceremony. It is not easy for most people to stand in front of a crowd and weddings are one of the most stressful events most couples will face. As stress levels increase, the ability to think clearly decreases. As your wedding officiant, Lori will handle the details and guide you through a smooth, stress-free ceremony. She will provide you with the cues to walk you through your vows and every step of the ceremony. No need to worry about making mistakes, it is her job to assist you with the details: every word, position, and movement. Your wedding is more than a ceremony, it is a reflection of your personality as a couple. It should be a memory to preserve with those you cherish most. The words that are spoken are a celebration of your relationship bound for many years to come. From casual, to upscale, to simple or formal elegance, Lori will personalize your ceremony to make a memory that reflects who you are as a couple. She will give you peace of mind that your ceremony will be everything you have ever wanted it to be.